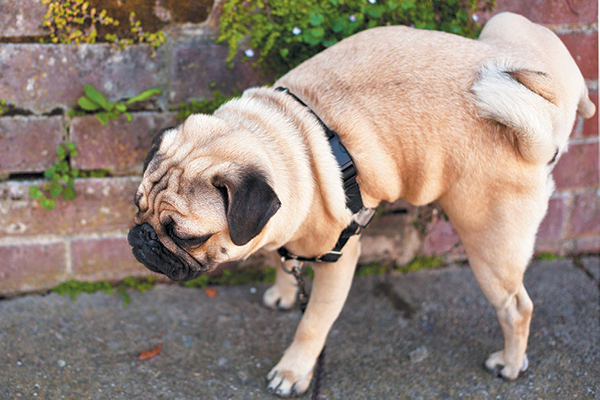 Theories abound about what in dog urine is toxic to plants, a popular one being extremes of pH. People say that acidic urine burns the plants, but the real answer to “Why does dog pee kill plants?” is a lot simpler. First, answering the questions — Does dog pee kill plants? And why does dog pee kill plants? The main thing that makes dog urine more damaging is volume. Large dogs deposit more urine. Females tend to deposit it all in one location. Male dogs are easier on the grass but hard on trees, where urine sprayed on the trunk can filter down to the roots and in large enough volumes can kill the entire plant. Just how much dogs contribute to the poor health of some city trees is under debate. But we’ve all seen the grates, bags and other contraptions to try and keep the trees pee-free. So, what can you do about dog pee killing plants? You can use training to modify behavior, getting your dog to pee in certain areas and to use the gutters rather than the grass. But most dog owners draw the line at being quite that prescriptive. So there are a number of other tips to reduce the conflict between pup and gardens. Focusing all the dog pee in one spot can help with the problem … if you give up putting any plants in that area. A stake in an out of the way area may attract males to use the area. Likewise, when you are out and about, if your dog will use mulched or graveled areas, this will reduce stress on plants. Of course, a dog’s gotta go when a dog’s gotta go. But when you have the option, steer Fido to a lamppost rather than a tree and a bark covered area rather than a stressed-looking lawn. You can spot stressed trees by bark that is discolored or even peeling off around the base. And trees that are under six inches in diameter or have thin bark are at higher risk. If you can, watering the peed-on area immediately can help dilute the urine and minimize plant damage. For similar reasons it is a good idea to ensure your dog always has ample access to water. More diluted urine will do less damage. And besides, who wants to have a dehydrated doggie? Various potions are on sale to break down the ammonia even more effectively than water. So if you have an especially cranky neighbor and your dog just really has to go on his property, you might consider carrying a squirt bottle of pee-weakener on your walks to minimize the damage. If your local stores don’t have it, you can order it online in tablet form and make the solution up as needed. If you are establishing or replacing a lawn, look into more robust grass species. Most lawns use something like Kentucky bluegrass, which has shallow roots and is easy to transport and establish. But it is also one of the more sensitive varieties and easily damaged by urine. Bermuda or ryegrasses may be more difficult to establish but they are hardier once they settle in. Whether you are more of a dog person or more of a plant person, or a bit of both, it is always a good idea to try and reduce conflict where we can and make the community a great place for both puppies and plants. Next postCoping With Spiders: Smash & Burn?